Start of the end-of-week race at Ski For Light. Part 2: A Guide’s Story. 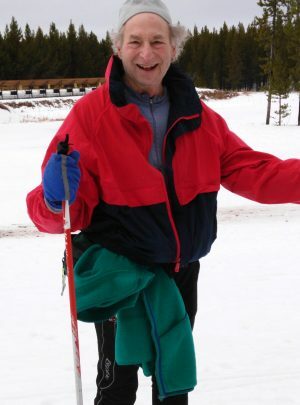 In 1992, after several years of bad snow in the mid- Atlantic region, I signed up to go to Colorado for a week to be a guide for Ski For Light. At least I would get to ski on some good snow. Well, I have missed only two years of guiding since then. The reason is simple. I like it. No, that is wrong—I love it. Why do I love it? It took me some soul searching to figure that out. I have to admit that it does feel good to help other people, but most of my reasons are more selfish. Of course, even feeling good about yourself for helping people is selfish, but here are the real selfish reasons why I love being a guide. 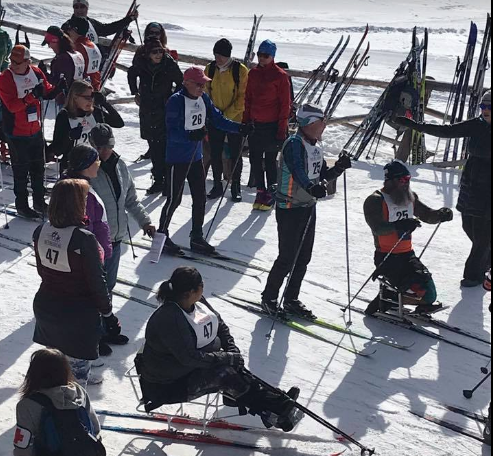 Volunteer SFL guide Bob Civiak has been helping blind XC skiers for 25 years. 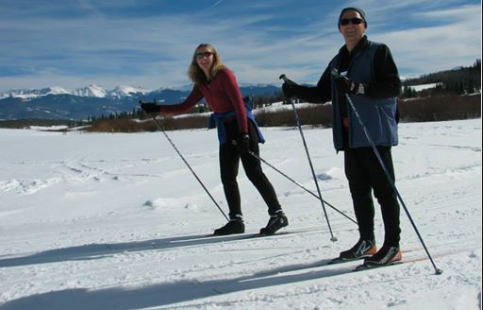 First and foremost, I love cross country skiing. Going to Ski for Light forces me to make time in my life for a full week of skiing no matter what. But I could go skiing for a week without being a guide, so there must be something else. A major reason at the beginning was that I liked racing. I was never a successful competitive racer and when I started SFL, I was already in my mid 40’s and so my prospects for winning races did not look good. However, in my first year, I guided Janice Newman, and she was the first woman finisher in the 10K race. Boy, was that a rush. My second year was even better, I guided Laura Oftedahl to first place overall, finishing ahead of several Norwegian men. That was my peak success as a racing guide. I was hooked. I am no longer able to guide the fastest skiers at SFL, but still thoroughly enjoy guiding and take great pride in doing it well. 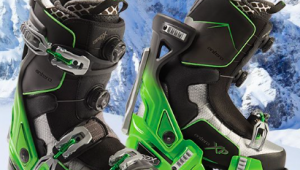 Now my competitive juices are stoked by helping skiers who want to ski better than they have before. In 2017, I helped Ron Baron, who had never skied 10K, reach that milestone on Thursday. The next day, race day, he did it again, but was 30 minutes faster. I vicariously shared Ron’s sense of accomplishment and took pleasure in the look on his face when we finished, but I can’t deny how much I enjoy the personal triumph of being a good teacher and spurring him on to do his best. Is there something more at SFL? We all know there is. The atmosphere at our events is totally unique. I have never been in a more supportive and positive environment. For 51 weeks a year, I tend to be a little cynical, to see the glass as half empty, and to fret about where the world is heading. I simply can’t do that at SFL. I get caught up in the passion of everyone helping everyone else, hugging, and spreading positive cheer. All of the glasses at SFL are at least half full, if not brimming over. People are there to have a good time and won’t let anything spoil that. As I’ve heard from SFL leaders, “If you cut through it all, SFL is just one big party.” What’s not to like about a big party. After 25 times at SFL, I have made dozens (if not hundreds) of good friends. By now, I would be going if for no other reason than to have a good time with my friends. On top of that, I get a new person to guide and to bond with each year and form a new friendship. But there are even more things I love about SFL. Before I came, I never could have imagined the personal inspiration I would get from spending time with people who refuse to let their disabilities keep them from achieving remarkable things. I am not only talking about skiing. There’s also sit skiing, traveling, finding their way around hotels, running meetings, and organizing the event. I am amazed at the lawyers, scientists, business owners, consultants, entrepreneurs, judges, teachers, bankers, and high level government workers I have met at SFL. If even a tiny amount of SFL’s motto— “if I can do this, I can do anything”—has found its way to me, I am a winner. SFL blind people take minor adversities completely in stride. Bump into a pillar—don’t complain—that just becomes a reference for future navigation. I have left my most selfish and embarrassing reason for last. Of course I have learned that every blind person is unique and has their own mind, wants, and desires. As a guide, I respect and support that; however, when we are walking and they are holding my arm, or when we are skiing and I am guiding, they depend upon me, and I am leading the way. I never had children, and the idea that someone would rely on me and allow me to make decisions about their safety and well-being is something that I revel in. I have several other reasons I like being with blind people. They tend to be open, honest, unpretentious, vulnerable, free to ask for help, appreciative of things that I can do easily, and willing to help me when they can. There you have it. I don’t consider myself a do-gooder. Rather, I like skiing, I take pride in being a good guide, and I like to be in charge. I also like being appreciated and hugged, getting a vicarious thrill from other people’s achievements, and getting caught up in the magical positive spirit of SFL. All of that, and seeing my good friends, is why I keep coming back. 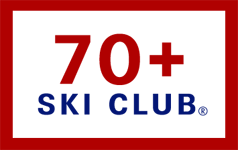 Click here to donate, volunteer, or become a guide at Ski For Light. As a person who worked with visually impaired Alpine skiers for 34 years I can honestly say I got more out of it than I ever put in. Nice article and the sentiment expressed so well.